The sixth monthly seminar in fiscal 2018, organized by the Department of Art Research, Archives and Information Systems, was held on November 27th. Dr. Emi MIYAKO, a part-time lecturer at the Tokyo University of the Arts, was the guest speaker, giving a presentation entitled, “History of Technical Development of Coloring on Silk: A Study on the Painting of Mahamayuri Vidyaraja (Kujaku Myoo) Owned by the Ninna-ji Temple.” Designated a national treasure in Japan, the painting of Mahamayuri Vidyaraja is a work that some historians date as early as the Northern Song Dynasty. Its exceptionally high standard of artistry is expressed in its dynamic rendering of elements, including the feathers of the peacock that appear as if they are moving. Distinctive realism found in this work is in stark contrast to conventional styles of Japanese Buddhist paintings. Dr. MIYAKO is an art historian with numerous academic achievements, as well as an artist who has been producing many outstanding artworks. In her presentation, Dr. MIYAKO compared a same sized copy of a painting made by GENSYO of Jisyo-in of Ninna-ji Temple in 1779 (Edo period), which uses the sukiutsushi technique (tracing of the original by laying silk cloth over it) with the painting of Mahamayuri Vidyaraja, and revealed that the Japanese silk support was sewn together whereas the Chinese version was seamless. 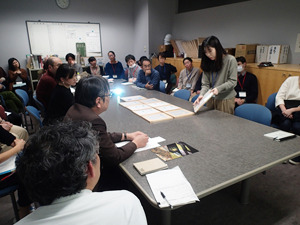 In addition, she presented many samples of silk cloths to show how different results can be when sizing is applied on the silk supports, even if similar painting techniques are used. An expression of artistry, or simply put “beauty” dwells in the “forms” in the work, and such “forms” are supported by realistic and physical techniques. However, this is one area, which classical methodology of art history was unable to tap. Through analyses of support, line drawings, coloring, and coloring materials, Dr. MIYAKO provided insightful knowledge, suggesting that further achievements can be expected from her future studies.